Addressing sagging, discoloured skin in the challenging neck and décolletage areas to make it look and feel smoother and younger. Using patented NeoCitrate and NeoGlucosamine, Triple Neck Firming Cream promotes the production of hyaluronic acid and collagen to even pigmentation, plump and firm sagging skin in the neck and décolletage. Skin Active Triple Neck Firming Cream protects the skin’s essential cells so skin looks and feels younger and firmer. The cream joins the clinically proven Skin Active line of advanced comprehensive anti-ageing skincare products which are formulated uniquely to reverse visible signs of ageing. 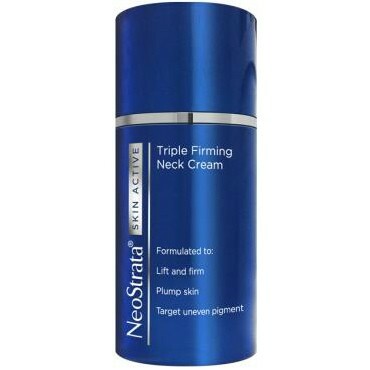 Skin Active Triple Firming Neck Cream contains a powerful blend of NeoStrata proprietary, clinically proven ingredients to provide younger looking skin by improving the look and feel of sagging, pigmented skin in the neck and décolletage.